In this post, we’ll share with you our review of the Blueair Classic model of air purifiers. What you’ll find with this line of Blueair cleaners is that they offer several advantages that set them apart from many other manufacturer products. In fact, Blueair works very hard to exceed industry standards and create air purifiers that offer unparalleled performance. Their goal is to create the best air purification solutions that ensure you breathe air that’s as fresh and clean as nature intended. We highly recommend these air cleaners for people with allergies, asthma and other respiratory problems who want to breathe the cleanest, most purified air. What you’ll find with these models is that they share five excellent features in common. Regardless of the model number you choose, you’ll enjoy these aspects listed below. 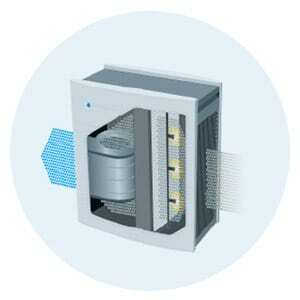 All Blueair Classic air purifiers contain HEPASilent® technology. 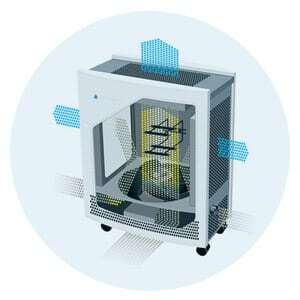 This feature is an enhanced version of the High Efficiency Particulate Arrestance (HEPA) filter that’s used in competitor products. The HEPASilent® technology is unique because it produces the highest rate of clean air delivery along with the lowest levels of noise. 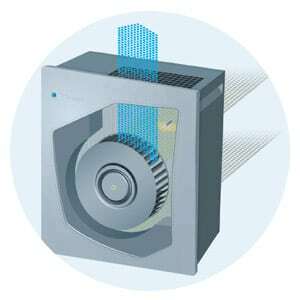 Each model captures 99.97% of airborne particles down to 0.1 micron in size and is whisper silent. Standard HEPA filters are only capable of capturing particles as small as 0.3 microns and do produce louder noise. Each Blueair air purifier is backed with the Energy Star rating. This ensures that every unit meets the guidelines set by the U.S. Environmental Protection Agency and the Department of Energy. The average cost to operate a Blueair air purifier is equivalent to the energy required to run a single household light bulb. We could dedicate a whole article outlining the various awards and special mentions that Blueair has received for their air purifying products, but to save time we’ve listed the top five acknowledgements below. No matter which Blueair product you choose: 203, 403, 503 or 603, you’re getting an air cleaning product that has an award winning design. A final aspect that you’ll find through the Blueair Classic series is that each model is independently verified by the Association of Home Appliance manufacturers (AHAM) and exceeds the Clean Air Delivery Rate (CADR) requirements. This ensures that you’re getting a top-of-the-line air purifier that’s dedicated to producing the cleanest air possible. All Blueair models come with a magnetic filter timer that you can attach to the unit, refrigerator, or anywhere else. This timer counts down and alert you to when it is time to change the filter. 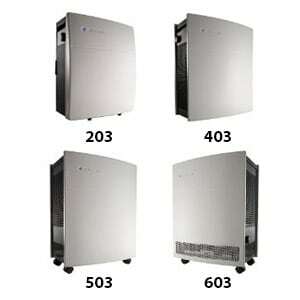 This ensures that you’re never getting anything less that the highest quality air inside your home or office. Now that you know which features all of the Blueair Classic models have in common, we’ll point out how each one is different. This section should give you a clear idea which model number you should consider for your home or office. Suitable for small rooms. Handles a maximum of 240 sq. ft. Perfect for tight spaces and can be placed near a wall or in a corner. Only requires 4 inches of clearance behind the unit to work at peak performance. The airflow pattern pulls dirty air in from the back and pumps in out the top. Filter is easily changed through a door on the back. Considered to be one of the top recommended air purifier for allergies you can buy. Suitable for medium sized rooms. Handles a maximum of 365 sq. ft.
Can be placed in many different locations, including right up against a wall due to the airflow pattern. The airflow pattern pulls in dirty air from one side and pushes out clean air on the other side. Filter changed door is located on the front of the unit. Has 4 fan speed controls. Suitable for large sized rooms or office areas. Handles a maximum of 580 sq. ft.
Can be placed right up against a wall due to the airflow pattern. The airflow pattern pulls dirty air in from the bottom and sides and pumps out clean air through the sides and top. Includes wheel casters for you to roll it to wherever you want. Filter change door is located on the top of the unit. Has 3 fan speed controls. Suitable for very large rooms and office spaces. Handles a maximum of 700 sq. ft.
Has the highest CADR rating in the world. Practically identical to the 503 model listed above, but includes 4 fan speed controls.